In this lesson, we will learn how to define a concave lens, describe the paths of light rays refracted through these lenses, and explain how rays are focused by such lenses. 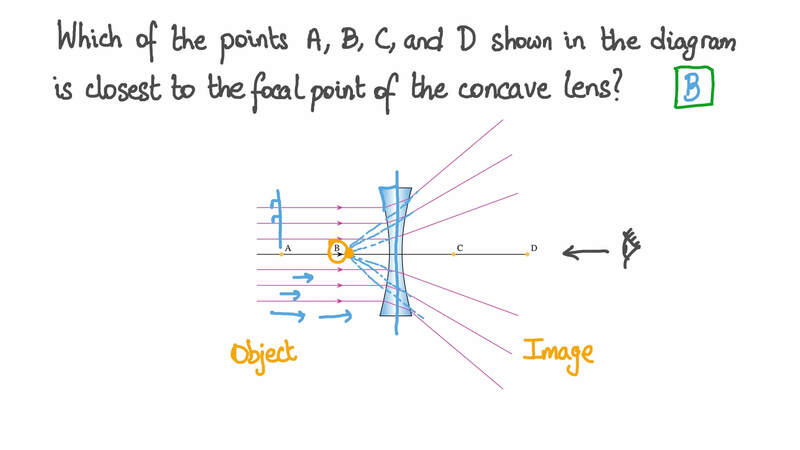 Which of the points A, B, C, and D shown in the diagram is closest to the focal point of the concave lens? At which of the points A, B, C, and D shown in the diagram is the angle of refraction greatest? Which of the following diagrams correctly shows the paths of light rays exiting a concave lens if the light rays enter the lens parallel to the axis of the lens? Which of the objects shown is a concave lens? Light rays converging to a point are incident on a concave lens, as shown in the diagram. Which of the other diagrams (A), (B), (C), (D), most correctly shows the directions of the rays that exit the lens?